New Delhi: Ravi Shankar Prasad, the Minister for Communications and Information Technology and Law and Justice presented ‘’Digital India Awards’’ to the distinguished winners here on Tuesday (20 December). The Government of India has initiated the ambitious programme of “Digital India” on its axiom of “Minimum Government and Maximum Governance”. To facilitate Government of India’s effort to promote and uphold the use of World Wide Web for enhancing efficiency and transparency of Government Machinery and encouraging its speedy transition towards Digital India. 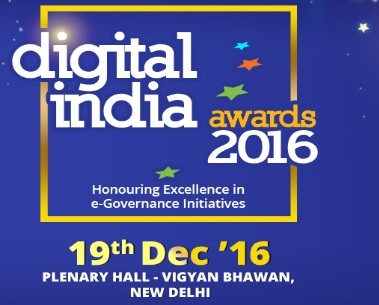 National Informatics Centre (NIC), under the ambit of India Portal (http://india.gov.in) organized the first edition of Digital India Awards. Digital innovation along with E-Governance initiatives of Government Ministries and Departments across India were evaluated under various categories. Three awards Platinum, Gold and Silver were presented in each category to the winners shortlisted from the nominations received under each category. The categories included Exemplary Online Service, Open Data Champion, Most Innovative Citizen Engagement, Outstanding Digital Initiative by Local body, Best Mobile App, Web Ratna – Ministry/ Department, Web Ratna – State/ UT, Web Ratna-District. In the Exemplary Online Service Category Platinum Award was bagged by VYAS- VarnijYakar Automation System for Department of Commercial Taxes, UP, followed by E-permit, Commercial tax department, Gujarat and One Stop Clearance System, Punjab Bureau of Investment Promotion winning the Gold and Silver award respectively. In the Open Data Champion Category Platinum Award was won by Office of the Registrar General, India. The Health and Family Welfare and Directorate of Marketing & Inspection won the Gold Award. The Silver award was bagged by the Rajya Sabha and National Crime Records Bureau. For Most Innovative Citizen Engagement, MyGov won the Platinum Award. Online Management, Monitoring and Accounting System (OMMAS) for Pradhan Mantri Gram SadakYojana (PMGSY) won the Gold Award. The Silver Award was won by Coimbatore City Municipal Corporation. The Jury Choice was given to IT Initiatives of SimhasthKumbh, Ujjain. In the Outstanding Digital Initiative by Local Body Platinum Award was bagged by Surat Municipal Corporation, followed by Greater Visakhapatnam Municipal Corporation and Web and Mobile based Integrated Complaint Logging and Resolution Tracking System – Madurai Corporation winning the Gold and Silver award respectively. The Jury Choice was given e-NagarSewaUP – Electronic Workflow based Reform for ULBs in Uttar Pradesh. For Best Mobile App, Citizen Cop Mobile App Chattisgarh won the Platinum Award. Mid-Day Meal Mobile App, Himachal Pradesh won the Gold Award. The Silver Award was won by GARV – GrameenVidyutikaran App Ministry of Power. For Web Ratna – Ministry / Department category, the Platinum was bagged by Ministry of Human Resource Development, Gold by Ministry of Health & Family Welfare and Silver by Ministry of External Affairs. For Web Ratna – State/ UT category the Platinum award has been won by Rajasthan followed by Tamil Nadu and Haryana in the Gold and Silver section respectively. For Web Ratna – District category the Platinum award has been won by Website of Collectorate, North Goa, followed by e-Governance friendly website & Initiatives of District Kupwara, J&K and district administration Udham Singh Nagar website, Uttarakhand in the Gold and Silver section respectively. A Compendium for Digital India Awards 2016 was also released on this occasion. A comprehensive government services portal was also launched by the Shri P. P. Chaudhary on this occasion. The Minister of State for Communications and Information Technology and Law and Justice Shri P. P. Chaudhary; Smt. Aruna Sundarrajan, Secretary,Ministry of Electronics & Information Technology|(MeitY); Principal Scientific Advisor Sh. R. Chidambaram; Sh. Ajay Kumar, Addl. Secretary, MeitY; Smt. Neeta Verma, DG, NIC; Smt. Alka Mishra, STD and Senior officials from (MeitY), NIC, state and Central Senior dignitaries were also present. Digital India Awards plays a major role in recognizing the noteworthy and sustainable initiatives in the realm of e-Governance for better delivery of information and services. At the same time Digital India Awards have re-established itself as an important platform to disseminate information about such path breaking initiatives, encouraging others to customize and replicate the successful solutions. The Awards through its unique initiative has contributed to the overall increase in quality and quantity of web presence of various government departments across the country. Most importantly, it has created an atmosphere for further innovation in the web based services sphere promoting and encouraging Government Departments/Ministries and States to come out with their best.